With over 60 years of service and over 90,000 satisfied clients, Long Beach Heating & Air Conditioning is Long Beach's most trusted and experienced heating and air conditioning contractor. We provide high-quality furnace service and repair at very fair prices with exceptional customer service. While we are one of the oldest HVAC companies in the area, we use the industry's leading practices for furnace service and repair. We keep our trucks well stocked with the latest HVAC diagnostic equipment and tools, and perform all work to current building codes. By providing exceptional heater service and repair to our customers throughout Long Beach, Los Alamitos, Huntington Beach, Downey, Manhattan Beach, Hermosa Beach, and beyond, we've earned a spot among Bryant's® prestigious “Circle of Champions” two years in a row and earned high ratings on Customer Lobby, Angie's List and Yelp. At Long Beach Heating and Air Conditioning, we believe in doing business the old-fashioned way: with honesty, integrity, quality workmanship, and personalized service. We've instilled these values across everyone on our team, from the front office staff to our installers and service technicians, and have built our reputation on it. As a result, we have won multiple awards for our exceptional service and have served over 90,000 satisfied customers. Call us today to tell us about any issue you are having with your heater or furnace. We'll schedule your appointment at a time that works for you and/or provide helpful guidance over the phone. Our service technicians are NATE certified and factory trained by Bryant. 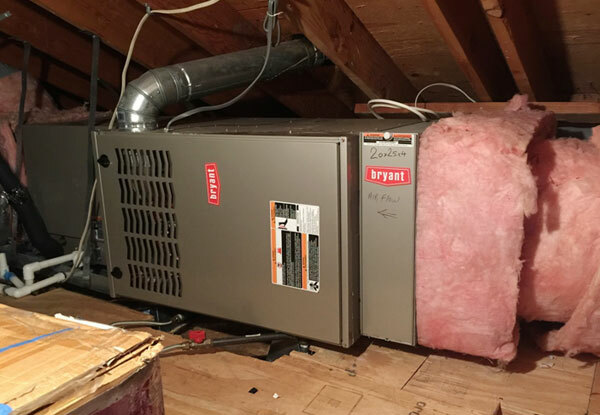 They have years of experience and are thoroughly knowledgeable in diagnosing and fixing a wide range of issues for all types and brands of heaters, including furnaces, heat pumps, and packaged systems manufactured by Bryant. Once we diagnose the cause of your furnace issues, our service technician will present and explain your options for repair to you so you can make a well-informed decision on how you'd like to proceed. We keep our service vehicles well stocked with many of the most commonly needed parts, such as filters, motors, gas valves, and safety switches, so that we can complete the majority of furnace repairs on the first call. If we don't have an item in stock, we can order it. You always have the options of using universal parts to save money or OEM parts to stay compliant with a manufacturer's warranty requirements. None of our service technicians work on commision. When they are on a service call, they are focused on doing everything they can to fix your system. A well-maintained furnace can last well over a decade and we want you to get the most out of yours. If you have a much older heating system and safety, reliability, or energy efficiency is starting to become a concern, we can go over your options for replacing it. If you decide to replace your furnace, we'll waive the diagnostic fee. Call today to schedule a furnace repair or service visit in Long Beach, Signal Hill, Huntington Beach, Los Alamitos, Palos Verdes, Downey, or any other nearby city. We charge $89 for diagnostic visits, and provide upfront, flat-rate pricing on repairs. We're fully licensed and insured, as well as locally and family owned. We're available Monday through Friday, from 8am to 5pm, and provide priority scheduling to those on a Residential or Commercial Service Agreement. We use drop cloths around our work areas, and wear booties if we need to walk inside your home or business. All furnace repairs are backed by a 30-day warranty on parts and a one-year warranty on labor. This organization far exceeds any thing that we expected to get from the first time I used them when my wife and I lived in our condo. Tom and his crew both in the field and in the office are all around great. 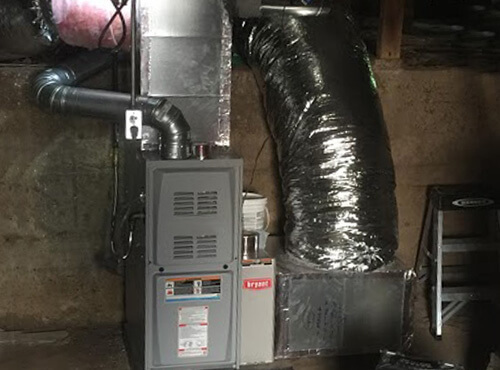 Long Beach Heating and Air Conditioning installed this residential furnace last year. Our client opted for a maintenance plan that allows us to keep the equipment running in top shape. Our preventative maintenance agreement includes a comprehensive system check, cleaning or replacement of filters, and freon replenishment as needed. We are proud to have the most experienced team of HVAC maintenance technicians in the Long Beach area.